How ironic that it was directed by a socialist who wanted it to be socialist propoganda. That is strange. Its the exact opposite. At least that is how it comes off to me. I love this movie. I own it myself. I know. I had heard that myself... I guess that's the problem with making a film that's too nonspecific and objectively true. It gets applied truthfully, whereever it best fits... and that's not necessarily where the clandestine writer intended. Yeah. In one respect, great art--especially in film--must be nonspecific, subtle, showing something without screaming, or even telling, it. There are plenty of movies that are just the opposite: based on an explicit fight for "freedom," without ever showing what that "freedom" means or is. Of course, the reverse side of subtle and objective representation is that it can be misconstrued. 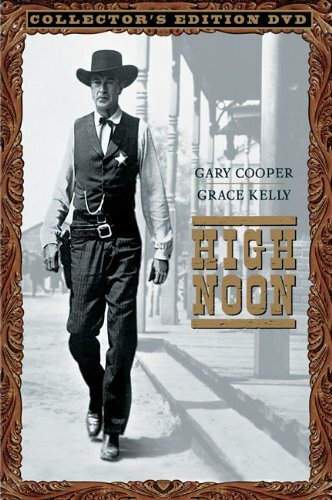 But I can't see how High Noon could possibly be interpreted as socialist propoganda. I would guess that even the director must not have been satisfied with its outcome--in that sense. Perhaps he had in mind a truth he wanted to present--but once he presented it, it was obvious to anyone else that whatever association that truth had to socialism was only in his imagination. Apparently the story was supposed to be a reminder to the rest of the Hollywood communists to come out in support of those latent, "heroic" communists who were being threatened by McCarthy. I'm guessing that the sheriff character is an allegory(?) for each person who was called to testify before HUAC and asked, "Are you now, or have you ever been, a member of the Communist Party? ", and that the outlaw gang lead by Frank Miller is supposed to stand for Senator McCarthy and the inquest panel. And oh yes, the frightened communists in the Hollywood community are supposed to be represented by the reticent townspeople. As we see it, however, the sheriff character describes the nonconformist innovator, and the outlaw gang describes the parasite culture-mob, and the townspeople represent other would-be "prime movers" who sit idly by and think they'll be safer that way. Personally, I think only the second interpretation is anywhere near appropriate. This film is integrated. I have watched it several times and it never fails to reveal more of itself. The plot is formulaic, really. Nobody in town wants to help the marshall -- each for their own reasons. Marshall Kane realizes that if he does not face Frank Miller now, then he and his wife will never be able to run far enough away to feel safe. That's the easy part. This is not so much a "movie" as a stageplay that was filmed. The Fountainhead has the same quality. As a consequence, the sets are sparce and symbolic. Each shot is an animated drawing. If what Orion said is true, then I agree with Alex that good art is non-specific. Ultimately, it does not matter if Frank Miller is Joe McCarthy. We all face these moments. How you face them depends on who you are -- and how you face them defines who you are.